Rido Saputra, 10 years old, stands in front of his home which was destroyed by the tsunami in Donggala Regency, Central Sulawesi, Indonesia (3 October). He was speaking at a leaders’ meeting on Thursday of the Association of South-East Asian Nations (ASEAN), in Bali, Indonesia. The UN chief expressed his condolences and solidarity with all those affected by the earthquake and tsunami in the Indonesian island of Sulawesi, and pointed out that four of the countries most affected by the disaster are ASEAN members: Myanmar, the Philippines, Thailand, and Viet Nam. The UN chief described specific examples of action, including an end to deforestation, a drastic reduction of fossil fuel use and a ramping up of renewables; investment in climate-friendly sustainable agriculture; and research into new technologies such as carbon capture and storage. On Friday, Mr. Guterres will travel to the city of Palu, Central Sulawesi, to see for himself the devastating effects of the tsunami and earthquake. 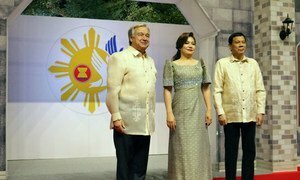 Addressing the ninth Association of South East Asian Nations (ASEAN)-United Nations Summit in Manila, the Philippines, Secretary-General António Guterres called for collective global and regional action to combat the challenges facing the world, in particular, those related to climate change. 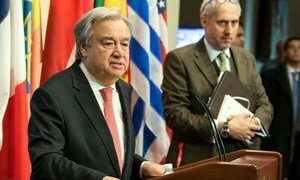 As the impact of climate change worsens around the world, United Nations Secretary-General António Guterres has called on the global community to redouble efforts to help countries respond to climate shocks, especially the most vulnerable.